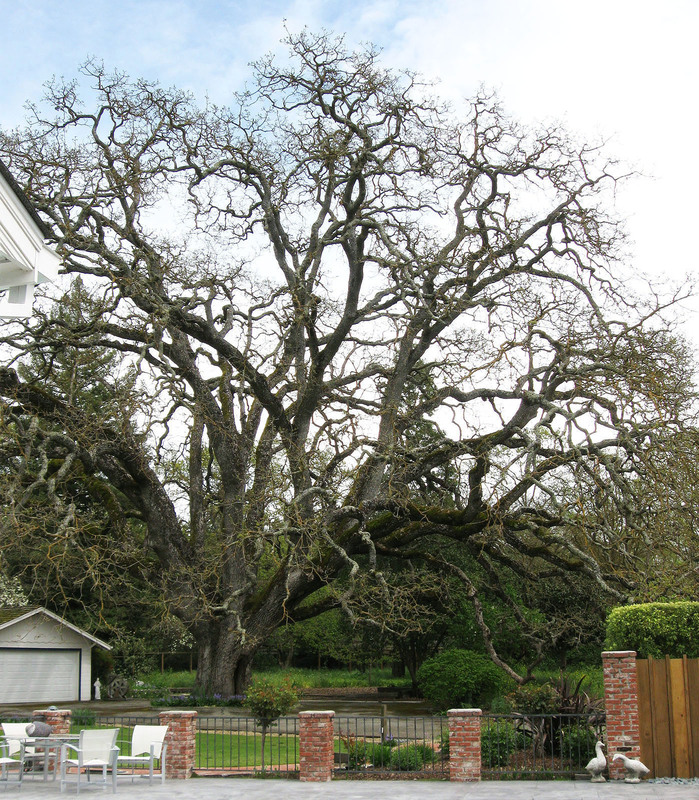 This is one of the best oak trees I’ve seen, in a Lafayette yard where we did some work a couple of years ago. I was back to check on the pondless waterfall this past week (still no leaks or pump problems, knock on wood), and I was glad to see the oak is just as amazing as I remember. At the time I thought it was a Garry Oak, but apparently the various arborists and oak experts who have looked at it have given several different ID’s, saying it could be a Garry Oak, a Valley Oak, or a hybrid between the two. They also differ on their estimates of its age. Everyone agrees, though, that it’s big and old and beautiful. This entry was posted on Wednesday, April 21st, 2010 at 7:23 am and is filed under california natives, plants, trees. You can follow any responses to this entry through the RSS 2.0 feed. You can leave a response, or trackback from your own site. That was one of the best oaks I’ve ever seen as well. It’s truly amazing. Glad to hear it’s still happy. Never heard of this kind of oak, very impressive! I like a very old live oak or laurel oak too. I have to keep looking at the size of the garage by comparison to see how huge this tree really is. I’m glad they kept the oak when they built the house–There’s no question which came first! I was pretty old when I realized that Oakland was named after the oak trees. It looks as happy as ever. I read that Valley and Garry Oaks are oak rot resistant. The deciduous valley oaks are the signature trees of that area. This one is particularly old and big. The garage does help provide scale. Big ones like this are quite well appreciated in the area. It’s the smaller ones which could eventually become this great that are not always appreciated, I find. Stunning. You make a great point about the young trees that could become like this that aren’t so appreciated. It’s sad that there just aren’t too many old beauties like this left. Yeah there can never be enough tree like this. Oaks survive construction better than most trees, so there are a surprising number in that area. The live oaks are declining a lot faster than the valley oaks; those can be really beautiful too, so their decline is pretty disturbing.